Providing you the best range of progynon depot injection, estradiol valerate injection and cabergoline tablets with effective & timely delivery. 1 Box Contain 10 Ampules. Progynon Depot 10mg vials contain oestradiol valerate 10mg, a long-acting estrogen preparation for use by injection, to replace the loss of estrogen at menopause, relieving menopausal symptoms. What is Progynon Depot used for? Progynon Depot 10mg vials are a hormone replacement therapy (HRT) used to substitute for the lack of oestrogen production by the ovaries that happens during menopause or following surgical removal of the ovaries, to relieve moderate to severe symptoms of menopause caused by oestrogen deficiency, such as hot flushes, night sweats, sleeplessness, vaginal dryness, headaches, mood swings, lack of concentration and loss of energy. Progynon Depot is also are also used to help prevent postmenopausal bone loss (osteoporosis) and reduce risk of fracture. Progynon Depot is used to relieve the symptoms of advanced androgen-dependent carcinoma prostate cancer. Oestrogen stimulates the development of female characteristics, and Progynon Depot is used as part of a transgender hormone therapy for male to female . How does Progynon Depot work? Progynon Depot 10mg vials contain oestradiol valerate, a synthetic form of naturally occurring oestradiol, which is the major and most active form of the female hormone oestrogen, and is biologically similar to the natural hormone. 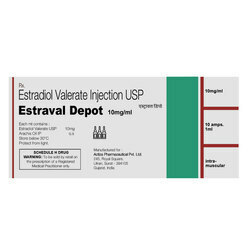 Each vial contains 10mg oestradiol valerate in a sterile oil solution, which is a long-acting estrogen preparation for intramuscular use by injection. Oestrogen is a steroid hormone produced by the ovaries that binds to specific receptors inside oestrogen-responsive cells and stimulates them to make proteins involved in producing secondary characteristics, such as breast development and in regulating the menstrual cycle. Oestrogen also has several other actions in various metabolic processes including maintaining bone mass and lipid (fat) metabolism. What does Progynon Depot contain? Progynon Depot 10 mg vials contain the active ingredient oestradiol valerate, a synthetic form of naturally occurring oestradiol, which is the major and most active form of the female hormone oestrogen and is responsible for the development of female characteristics and regulation of the menstrual cycle. Each vial also contains a 1ml vehicle being Peanut oil (Arachis Oil)@Treating symptoms of menopause with Progynon Depot. Progynon Depot 10mg injections contain oestradiol valerate a long-acting estrogen, used to treat symptoms of menopause caused by a lack of endogenous oestrogen(produced by the ovaries), such as hot flushes, night sweats, sleeplessness, vaginal dryness, headaches, mood swings, lack of concentration and loss of energy. 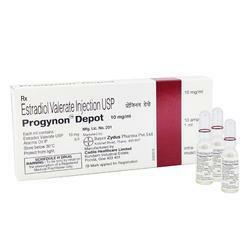 Progynon Depot 10mg injections contain the active ingredient oestradiol valerate, a synthetic form of naturally occurring oestradiol, which is the major and most active form of the female hormone oestrogen and is responsible for the development of female characteristics and regulation of the menstrual cycle. Progynon Depot 10mg injections are used for hormone replacement therapy (HRT) and substitute for the loss of oestrogen production by the ovaries that occurs during menopause or following surgical removal of the ovaries. 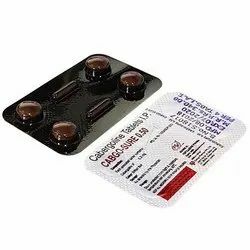 HOW TO USE CABERgoline TABLET Take this medicine in the dose and duration as advised by your doctor. Swallow it as a whole. Do not chew, crush or break it. Caberlin 0.25 Tablet is to be taken with food.HOW CABE Rgoline TABLET WORKS Caberlin 0.25 Tablet works by decreasing the release of prolactin, a hormone that stimulates breast milk production. This stops breast milk production in case of stillbirth, abortion or miscarriage. Looking for Other Pharmaceuticals ?